Is Google Becoming the Real-Life J.A.R.V.I.S.? Kyle Wagner has a great observation from Google I/O today on Gizmodo. Apparently El Goog is making Search conversational – similar to Tony Stark’s J.A.R.V.I.S. computer on Ironman. This has been on Android handsets for a bit in the form of Google Now, but Google just took it to the next level. The first big search move that Google announced today at I/O was to make it more personal, so you can search for things like “my flight to london” and get information for your upcoming flight to London. Naturally. 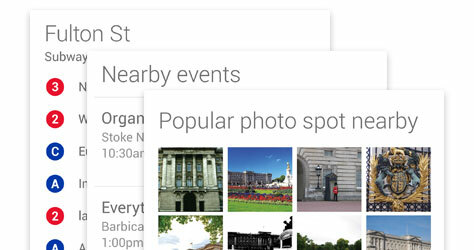 Like Google Now already does, but for search. More impressive, though, is Google’s push towards conversational search for PC or mobile devices, so you can just say, “OK Google, find a restaurant near my next appointment” and it’ll go off and do that. The promise of Siri finally realized. Hugely ambitious, powered by Knowledge Graph information to answer these questions. More practically, you’d be asking for things like seafood restaurants near a neighborhood you’re looking for, or photos near a landmark you’re interested in visiting. Or even how tall you have to be to ride a ride. Obviously, this is something we’ve been hoping for years, but never quite gotten right. There’s just too much context needed, too much advanced language recognition, too much computation. And yet that’s exactly what Google demonstrated today. We’re still skeptical you’ll be able to use it quite like in the live stage demos, but what we saw was pretty darned impressive. At the very least, it’s startling as a proof of concept. Google’s conversational search also works to send emails to individual contacts, even by just their first name. In one Google demo, an employee sent an email to a full contact, with a first and last name, just by the user saying “Send an email to Katie,” because it knew that’s who was meant.